Ceiling fans are a simple and useful way to spruce up a room. With Chesapeake Electric, your ceiling fan installation will be quick, done beautifully, and with as little inconvenience to you as possible! Whether you are replacing an existing fan or newly putting a fan into a room, we can get the job done! 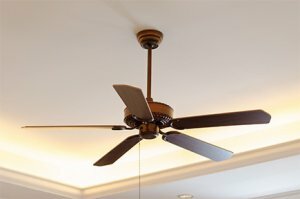 If you would like a ceiling fan installed or have questions our friendly and professional staff is here to help you. It’s our goal to make sure that the job is done right the first time. We are also able to offer you a free consultation when you call us today at (410)280-3388!